A few weeks back Jimmy Sue, owner extra-ordinaire of Texana Designs right here in Central Texas, came over for a little lesson in brayering. The only problem was, I didn't know what in the world I was doing!! But I did all I could think to do - look up a Michelle Zindorf tutorial, and wing it! 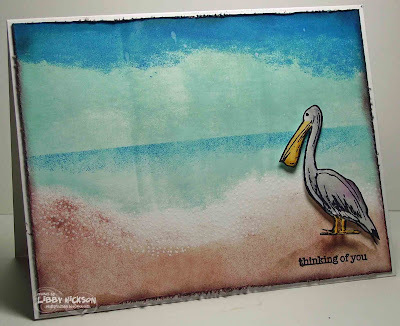 (I don't have the particular tutorial I used handy at the moment, but if you'd like to know let me know and I'll look it up for you next week...) The wonderful pelican image is from Texana. I'm pretty sure I was able to achieve that wavy look to my brayering simply because my brayer is warped!! 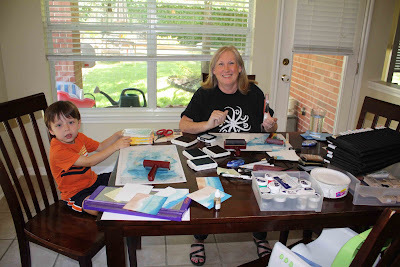 After this day of playing I quizzed my friend Lydia on brayering, and not only did she give me some pointers, she also gave me a non-warped brayer!! She is the best!! I plan to play a little more with brayering soon - I'll be sure to let you know how it goes. :-) And here's a photo from my afternoon of brayering with Jimmye Sue - who was so sweet to my son, who took an instant liking to her and rambled on and on about his animal cards, and invited Jimmye Sue to come back some other time to sit on the couch next to him and watch Madagascar. :-) Thanks for stopping by today! Beautiful card! I like your brayering. When I decide to venture out for this, I will come to your house and bring Katie so Carter has someone to watch Madagascar with. Your brayering looks fantastic and the little pelican is too cute. I'm brayer challenged, I hardly ever break mine out. That looks like a blast! It would be such fun to make cards and let the children learn too. Great job!